Making your eyeliner stay is the most talked about problem for makeup wearers. Here are the best 10 ways to make your eyeliner stay all day without touch up. It`s easy and effective. Find out more Top 10 Best Long-Lasting Eyeliners That Stay On All Day . 2. Put concealer on your lid to prepare it so that your pencil eyeliner will adhere to your eyelids better. This will also give the line more intensity. 3. Freeze your eyeliner in the fridge for 10 min before applying. This way, the line you create is crisp and the eyeliner doesn`t melt on your eyes throughout the day since some eyeliners are made mostly of wax. 4. Dust a bit of powder over your eyes after you finish applying the eyeliner or eye shadow. This will make both the eyeliner and eye shadow stay put forever. 5. After putting on your eyeliner, whether it would be black or brown or any other color, dust a complimentary eye shadow on top. This will give your eyes a subtle smoky look without too much work. I use an angled brush to do this so that the line is precise. For a more smudged and smokey look use a smudger brush. This will also create a gradient and add dimension to your eyes. 6. Spray some refreshing spring water or makeup finishing mist on your face after you finish applying your makeup. Not only will this help make your makeup stay put but your face will look dewy and fresh throughout the day. 7. Always pick waterproof or budge-proof eyeliner. Kohl eyeliner looks subtle and natural but they`re only good for the lower lash line or your waterline. Kohl eyeliner is also great for tight lining. For upper lash line however, liquid eyeliner or gel eyeliners stay on better. 8. Moisturize before putting on your makeup if you cannot afford a face primer. The stickiness of the moisturizer will make your makeup adhere to your skin. It also does not hurt to stay hydrated. 9. 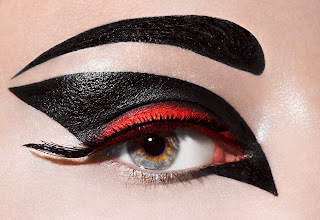 Do not apply very thick layers of eyeliner, the excess will smudge. Apply your eyeliner in two strokes; one from the middle to the outer part of the eye and one from the middle to the inner part of the eye. 10. Apply the eyeliner to a clean face with a bit of moisturizer and make sure that your eyes are not oily. The oil glands on the eyelid do produce oil throughout the day so use a blotting paper to blot out the excess oil or your eyeliner will find a way to transfer onto your lid. Please also subscribe to my Eye4makeup Youtube Channel for more videos and tutorials. Thanks so much! Ive always had that problem and these are just some of the things I figured out. hi i really love ur tips. i hope u could still continue sharing more tips... i have chinky eyes and what do you think is the best eye makeupfor my eyes. what shade?? I forgot to tell you to try the Physician's formula matte eyeshadow or the new Revlon Matte collection eyeshadow. They are just gorgeous. hey I my jaw line is very broad...which makes my face like really big...can you suggest something, that will help my face look thinner. I love the idea!!! Even though it is only seeds, that make the difference, I love that when you are done, it can be useful in other ways. @ anonmymous: I'm glad you are trying these ideas. I hope they work for you! Check out my new suggestions. And you are welcome! Hey there! Thanks for teaching! I always have a problem with the results because it gets thinner like after 4 hours. Thank you soo much. @ Isabella, you are very welcome! I've had this problem for sooo many years because of my asian eyelids. Now I don't seem to have that problem anymore:) Hope it works for you too! Hey!! Great tips and love the website perfect for me!! Could you suggest a eyeliner that is not gel or liquid because I tend to be very clumsy- espcially in the morning..! Thanks a lot!! @Anonymous: Yes for sure...use waterproof pencil eyeliners such as Urban Decay liner in zero or for a cheaper alternative the Milani liquif'eye liners are great and easy to control. Good luck. Great! Thanks for the tips! I can definately use some of them. As an Asian with what people called heavy upper eyelids, my eye make up (even eye shadow in powder, cream or crayon) falls all over below my lower eye lids easily. After trying on a lot of products, I found only a few long last water-proof and smudege-proof liquid liner last on my upper lash lines. Hi, yes I have the same problem. So far a few good ones have been Milani liquif'eye liner, Essence gel liner, Urban decay perversion and Prestige waterproof liner. I always still set them with a dark eyeshadow. Hope this helps! Layering helps a lot. I start with a liquid eyeliner or pencil and then add an eyeshadow over top. Sorry for the late reply! Sweet, definitely going to try some of these out!!! Subscribe to not miss upcoming beauty posts!